More and more brands are catching onto the pop up idea, offering instant pitch products for consumers in need of shelter. Be it for their vehicles, camping or business stalls, or perhaps just a family get-together in the garden. The previous issue was the demanding assembly of traditional canopies. That required multiple people, a few hours work and a savvy mind to negotiate the complex instructions. Well, no more. Companies have designed and manufactured a modern canopy that alleviates the problematic and lengthy assembly of the traditional canopy tents. 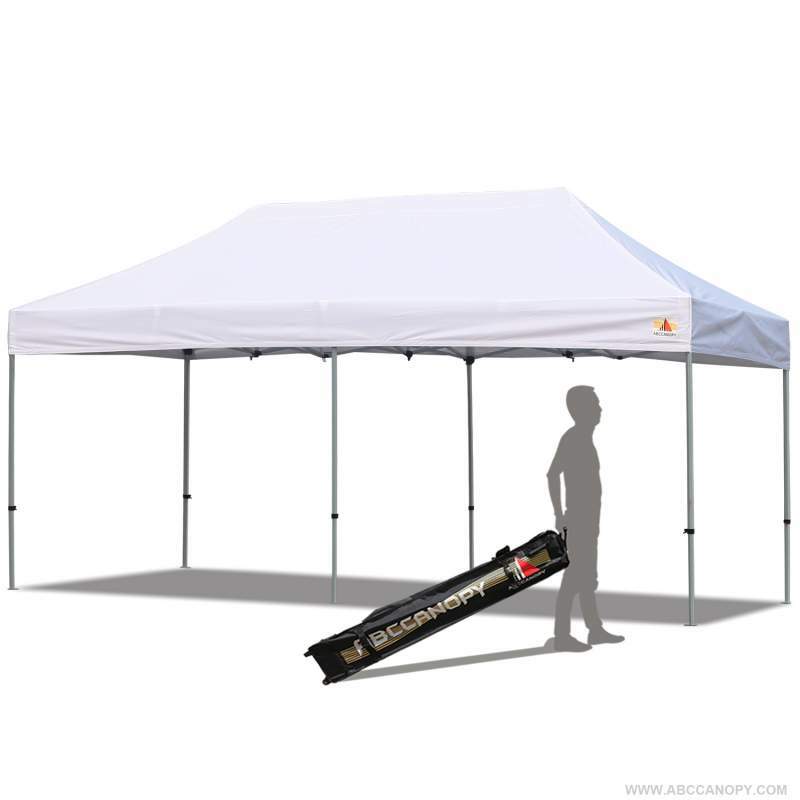 The pop up canopy is a perfect solution if you have met any of the issues we’ve mentioned. It’s also a fantastic instant shelter for any trade shows or market stalls or garden event. With an array of choices available on the market each with its own set of features, selecting one is a tough task. We have handpicked the best choices in each size range, as usual we will start with the smallest and work our way upwards. 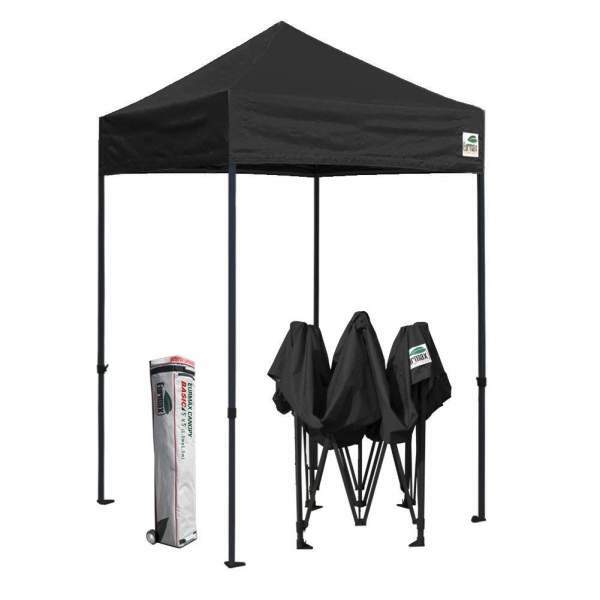 If you’re looking for a small and lightweight black pop up canopy for quick use, the 5×5 foot from Eurmax will be a great choice. The best-selling 5 x 5 on the market. With an abundance of cool features, durable frame and sleek black styling, let’s find out why it’s so popular. In a huge variety of colors, up to 14 colors, this makes them versatile for events. A sleek black for dinner parties and garden uses or white for your commercial shows and market stalls. The other benefit is that its made by Eurmax, they offer long warranties and have great support for extra parts and repairs. The frame comes pre attached and the steel frame opens up easily, just pull it outwards to extend. Then simply fit the polyester cover over the top. Free guy lines come with the purchase so you can secure it to the ground, or if on concrete, tie around a tree or use canopy weights to secure the feet. Utilizing modern technology with a thumb latch locking system, this makes setting up incredibly easy. It has a commercial full truss frame, which has been coated with a hammertone powder finish. This is designed to resist any rust caused by the elements and strengthen the foundation of the frame. The fabric has also been manufactured with a flame resistant membrane that has attained CPAI-84 fire certification. The material gives 99% UV protection which is great for any children, pets and yourself, and a UPF rating of 50+. Offering great resistance against the sun. Likewise against the rain, the material is 100% waterproof making it a fully waterproof pop up canopy. 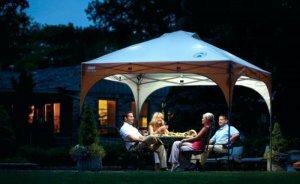 The GO Hybrid model is ideal for use as a sun shade beach canopy and garden events. With its slanted leg design it’s stable in strong winds making it preferable for outdoor use. It’s a 6×6 canopy with a 7×7 base, this is due to the slanted legs standing wider than the actual frame. This doesn’t add to the shade coverage, still covering 36sqft. It has sliders which can adjust the height to 3 different levels. Additionally it has been reinforced also with M5 hardened rivets which won’t falter under pressure from the sliders. 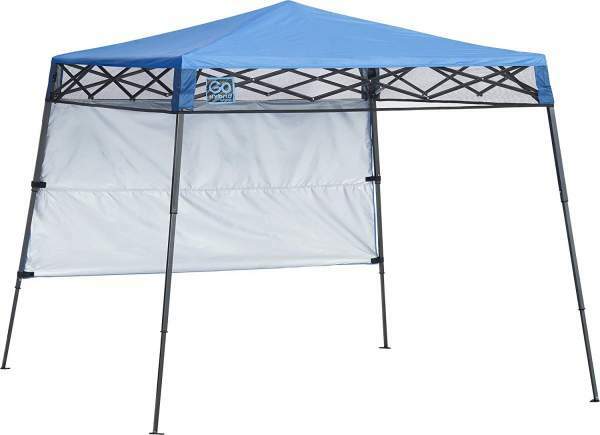 A lightweight pop up canopy weighing around 12lbs in carry weight, easily carried to and from the car or portable garage. A fast pitch canopy which sets up easily with 2 people but can be done alone. Just extend the frame outwards 60-70% of the way and attach the canopy on the top. Secure and extend fully. Adjust height with an easy pull-pin slider system on the legs, which is operated by a push button. There’s really no preparation or assembly needed to set up. A 170T fabric cover which has been manufactured with an Aluminex coating, protects the frame. This coating offers around 99% protection from UV rays. However, make use of the sewn in side wall as it really helps in reducing strong sunlight from behind. It’s not the biggest side panel so try to position accordingly, against walls/trees etc. for added cover. 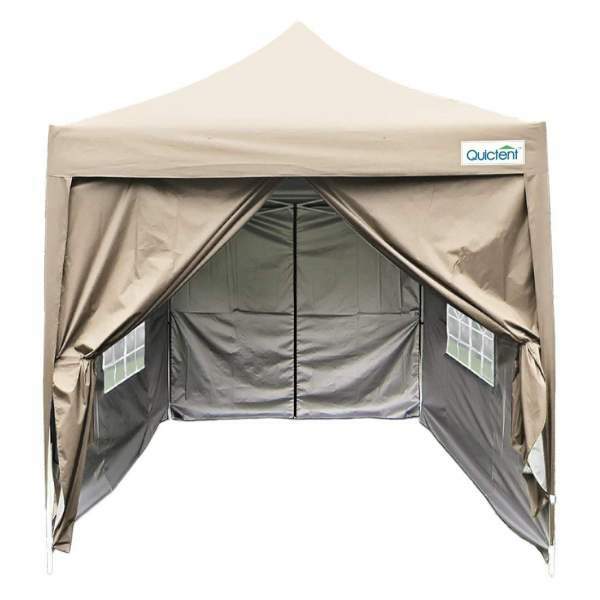 The heavy duty pop up canopy from Quictent comes with 4 full sidewalls, doors and 2 clear plastic windows on either side. Making it a fully screened shelter. Furthermore the windows are integrated into the fabric, rather than being attached (which offers less water protection). It also has a decent color range of 5 colors, including white, beige and red. Designed with a pyramid roof style to give it a higher center and more space compared with the standard flat roofed canopies. Another benefit is it also assists in rainfall run-off. With the high peak in the middle, rain will fall off to the sides, avoiding issues like water buildup around the edges of the cover. A strong steel frame which is reinforced with a powder coating to ensure rust resistance. It’s heavy duty, which will fare well in consistent adverse weather conditions. This is exactly what we are looking for in a commercial pop up canopy. Quictent are very confident about the strength of their frame in this product, so they have offered a lifetime free warranty on the frame itself. The fabric is also waterproof and has been put through water pressure testing during manufacture. Using a 420D Oxford silver coated fabric, this particular fabric is patented, so you won’t see it in other instant canopies on the market. All sidewalls overhang by 6 or so centimeters to fully cover the ground floor, stopping drafts etc. They’ve also seam sealed all the zip linings with a protective glue. Our next one is one of the best 8×8 models around. 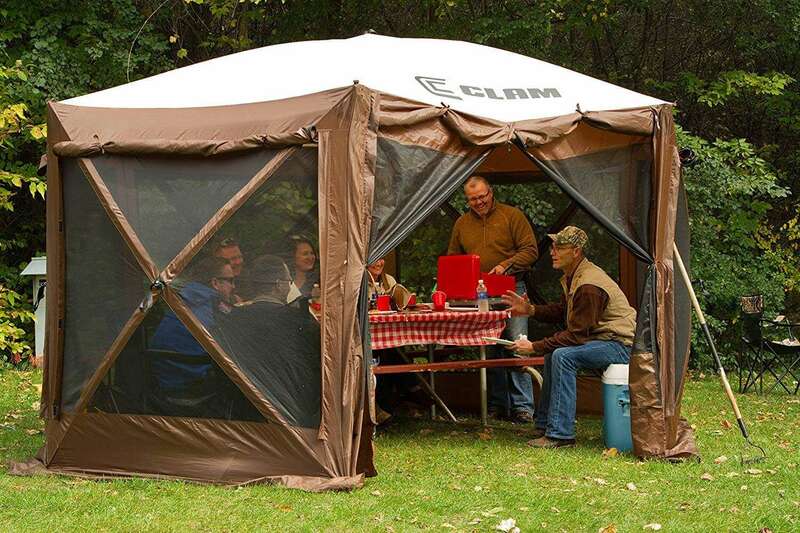 A versatile canopy, complete with sidewalls and meshed windows. Additionally, with these dimensions and features, it makes a great commercial shelter for markets and the like. Complete with a black powder coated frame makes it resistant to rust. The strong steel frame with nylon mold brackets and thick square shaped legs make it sturdier than previous models. The square legs allow compatibility with canopy weights to secure it tightly to the ground. The feet also have 2 holes drilled through them, so you can drive stakes or hooks through for extra security. Utilizes a 500 denier polyester fabric with a PU lining which is completely waterproof. The seams along the lining, doors and windows are all heat sealed to keep out the rain. Additionally, it has reinforced stress points on the usual problem areas, like where the top of the poles meet the canopy, this is an observant improvement by the manufacturer. The cover attaches securely to the frame with 2 inch Velcro Straps that run around the outskirts of the frame. This purchase comes with 4 weights in the form of sandbags. However, we do prefer the proper canopy weights that slide onto the squared legs at the base. More so, it includes 3 side walls and a door wall, these are all removable. They are equally 8 foot in size, surrounding the canopy, blocking winds, rain and sun. 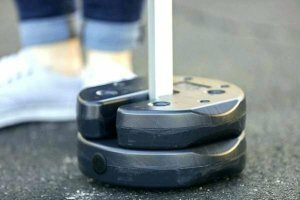 A wheeled roller bag is also a free addition. As big as the 8×8 from Abc, but more useful as a beach canopy. Because it’s portable, lightweight and easier to set up. Perfect for beach trips, sporting events and any situation that requires an instant shade. 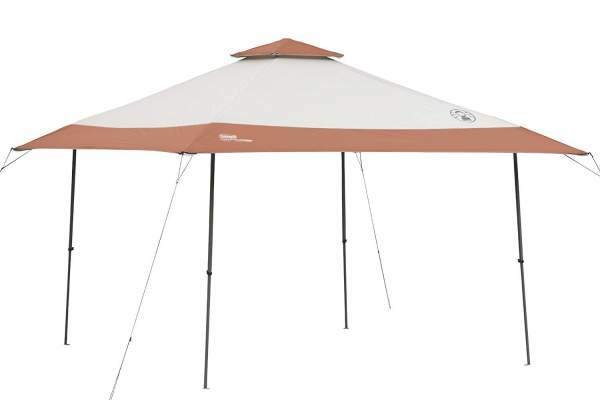 With a reflective white cover and straight leg design, it’s ideal for shading you and yours during sunny weather. With a ‘One Push’ system it unfolds and erects instantaneously, this one requires a one person set up only. There are quick release pins engineered into the straight legs offering 3 different levels of height adjustment. You may want to change to a lower setting if you have sleeping children and a creeping low sun, or simply for privacy. They have used Aluminex with a 150D polyester top. Which has been proven to resist up to 99% of UV rays from the sun, giving safe and trustworthy protection to your family. Our vice however is that sidewalls are not included so you will have to track down these additional purchases online. Consider using additional sidewalls with this model, especially on beach trips. You can attach the 8 foot or 10 foot sidewalls, sold by Abccanopy as an accessory, they are fully compatible with this model. 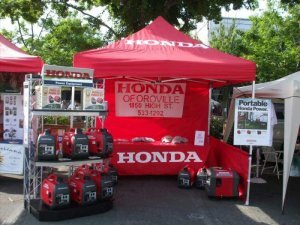 A unique feature of this model is the new striped color theme, that makes a truly effective market stall theme, perfect for business events where you need to grab the attention of any passerby. Full truss steel frame and black powder coating, it’s fully resistant to rust, rainfall and stands strong against winds. The meshed windows allow for the wind to pass through somewhat as opposed to hitting upon the sidewalls like wind on a sail. It also has nylon mold brackets and sturdy square legs. Again with 2 holes drilled into the feet to allow for extra security when pitching onto soft ground, like a trade show or tailgate event for example. The material used is fully waterproof and the seams have been heat sealed all around the sides, door and side wall attachments. The stress points have been reinforced, which is crucial for an investment such as this, the last thing you need is your canopy being out of action and in repairs. The canopy cover is secured tightly with Velcro straps running around the sides of the frame. With ABC, you rarely just pay for the canopy itself. They always throw in extras to add value to their products and this is no exception. It comes with 4 sandbags, ropes, stakes and sidewalls, plus the heavy duty roller bag. But also an additional half-wall attachment and mesh wall attachment. This offers a lot of versatility, customizing the appearance as you see fit. All in all, a great value deal for a heavy duty pop up canopy that performs excellently when used in commercial scenarios. Our next pop up canopy is from Coleman but this time with wider dimensions and a beautiful double vented roof to match. With its easy pitching method, lightweight frame and aesthetically pleasing design, it’s become one of the best-selling beach canopies on the market for this size. It offers a huge shaded area with the over-sized 13×13 rooftop. The cover is also vented, this stops hot air getting trapped within and creating an uncomfortable interior. It will rise and escape out of the vents above, keeping circulation going. The footprint is 10×10 and the legs are slightly angled, which adds to the stability of the structure. It digs in to the sand really well with this small design feature. Designed with a double vented rooftop, this gives a taller head height in the center. The head height is tall at 8 feet, allowing anyone to stand tall inside. The angled roof also allows for run off if you are hit with any unexpected rainfall. The cover is also fully protected from UV rays, up to 99% resistance. The frame is of an excellent standard as far as pop up beach canopies go. The frame is steel as opposed to the generic fiberglass or aluminum models and is protected with a powdered coating to resist rust, chipping, peeling. All in all this has many advantages over similar priced 10×10 and 12×12 models, due to its extra dimensions and lightweight framework. 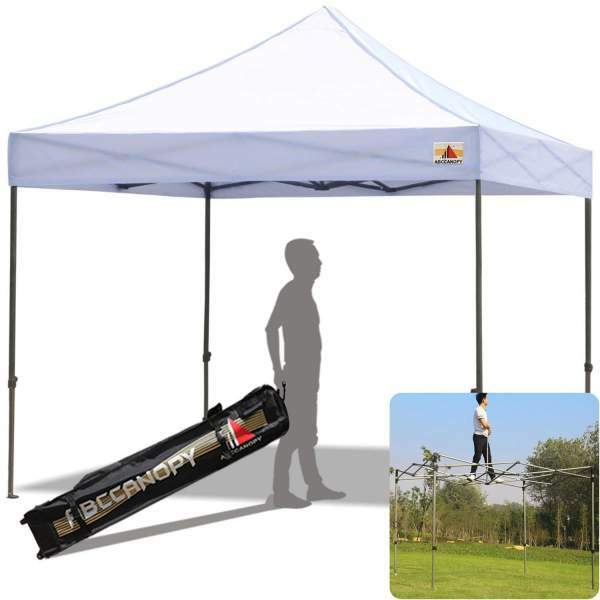 For something larger, elongated, then the 10×15 from ABCCANOPY will be a good choice. 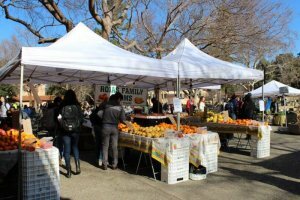 This is great for those of you who want a canopy for a market stall or rectangular stands. Perhaps you have a double length stall or a bar etc. The elongated design is a great option for this kind of scenario. Solid steel frame which is very durable but at the same time it can be cumbersome carry alone. It weighs close to 90lbs and will probably need 2 people to set it up properly. The frame has been black powder coated for rust resistance. The legs are square shaped and straight legged, compatible with the majority of canopy weights on the market. The feet are strong and have holes drilled into them, allowing stakes or hooks to be hammered down through. The mechanism operates by push button sliders, so you don’t risk trapping fingers during assembly. The cover used comes in a variety of colors, 18 in fact. Made with 500 Denier Polyester and PU lining makes the fabric totally waterproof. Perfect for continuous use outdoors. The seams have been reinforced by a heat seal, this acts as a barrier to any water droplets trying to penetrate the fabric. The cover attaches to the frame by way of 2 inch Velcro straps surrounding the underneath. 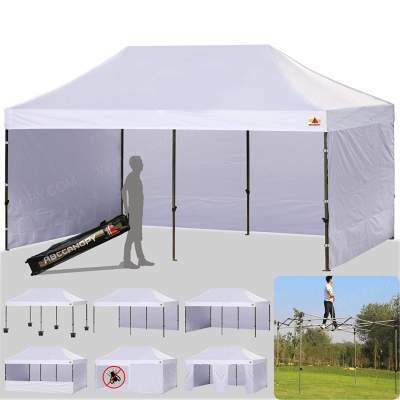 Can be enclosed completely with 210 Denier Polyester sidewalls. They also have PU lining and are waterproof. The heavy duty canopy is fully customizable, being able to add from 1-4 side walls depending on the scenario. Even the front door side has slight side coverage, allowing for a large front door. Front door is only partially covered. No additional clear screen for front door, would need to buy separately for full coverage. Here we have a great choice of instant shelter from ShelterLogic. A quick pitch canopy with an excellent frame, beautiful color choice and full protection from the sun. Well suited for friends and family in the backyard or tailgate event. Uniquely protected in the form of Thermoset baked on powder coating. This not only protects the frame from rust but also chips, peeling and corrosion. Solid all round protection. The frame itself is made from steel and the whole framework is put together with well-designed joints, that work effectively in the assembly and take down. Benefiting from a high level of protection the material has been manufactured with effective sun resistant material. It provides up to 50 UPF and acts as a barrier to UV rays, blocking 98% in total. An important factor when we are using it for family purposes, in the garden or local grill meets etc. For a traditional model of this size they would normally take 30-60 minutes to set up with multiple people. 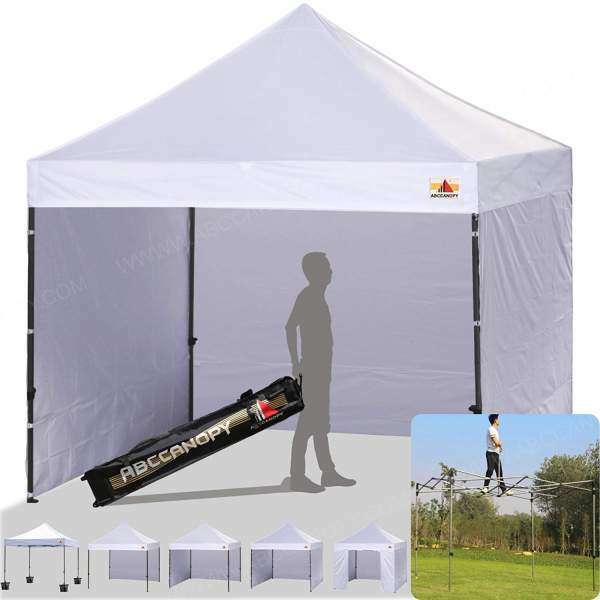 As its a pop up canopy it can be assembled within 15 minutes with just 2 people. It employs a 3 step process of extend, cover, extend. Then adjust leg height accordingly, attach weights and its pitched. We finish our list with a heavy duty version of the 10×20. Utilizing the pop up mechanics, within a durable, large sized framework, this makes for an efficient and easy to use canopy for your market stalls and trade shows. Coming in 7 different color variations including white, red and blue. You can choose the right style to match your taste. There are various customization choices with 9 sidewalls, you can adapt and change the appearance in a manner of different ways. Uniquely it comes with a meshed screen wall, so you can create a full surrounding cover, with protection from bugs and mosquitoes. This is something that wasn’t previously available in the 10×15 model. A great feature is the wall piece you can fit into the middle of the canopy, creating a divider. This is excellent for interior shops or market stalls. Weighing up to 118 pounds roughly, it will probably need 2 for the set up. However, they do include a free wheeled bag and its top quality. The wheels are built on a solid steel axle, so they run smoothly even on rough terrain. Handles are engineered well, they’ve included 1 separately at the top for rolling, and then 2 centered handles for lifting. This helps to distribute the weight accordingly, saving our backs. The frame has also been reinforced since the 10×15 model. The frame is full truss with strong 26 x 13 x 1 millimeter bars. 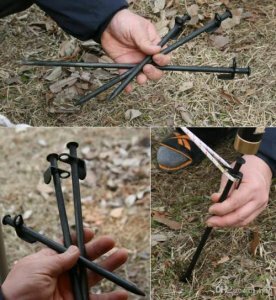 The feet are made of nylon and have also been drilled, for attachment of security hooks and guy lines when used on soft ground. For solid ground we suggest you use canopy weights. It does come with sandbags, but we think the slide on weights usually work the best. The frame also has push button sliders, which avoid any trapped fingers. So now you’ve seen all the top products and our reviews,the next thing you need to consider is what measurements you will need, color, protection and what kind of events you will need to use it for. Now that we have an understanding of all the best pop up canopies on the market, let’s have a look at the FAQ for any extra information. A portable, lightweight and instant set up canopy that has become very popular for outdoor and garden events, due to the simplicity and speed of its assembly. Generally set up by 1-2 people in under 10 minutes, as opposed to the traditional models of 30-60 minutes. 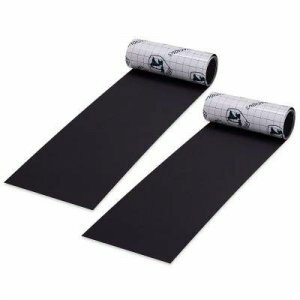 Waterproofed and utilizing a polyethylene cover and steel frame, they are robust and durable. Withstanding outdoor elements, with the right care and protection. A portable case allows you to carry them around easily, pitching and moving frequently with ease. 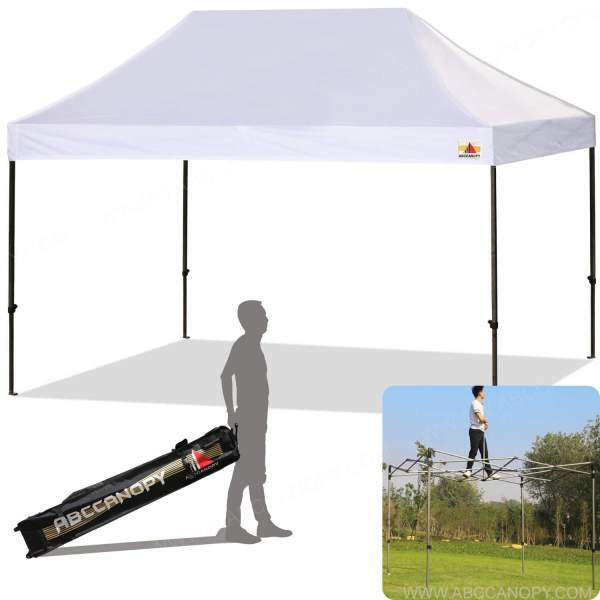 What is a Pop up Canopy Tent for? Lets look at all the various scenarios and events we can use them for. Market. They make great event stands and can become a focal point of any market or trade show. They also have enough space to have all your products on show. While simultaneously keeping the others dry, safely under the canopy. Trade shows. Giving a boost to your business is always a welcomed opportunity. For this reason, some see a quality Pop Up as an investment, rather than just a simple shelter. You can get yours personalized at places like Impact Canopies and Tent Printing, for example. Boot Sales. 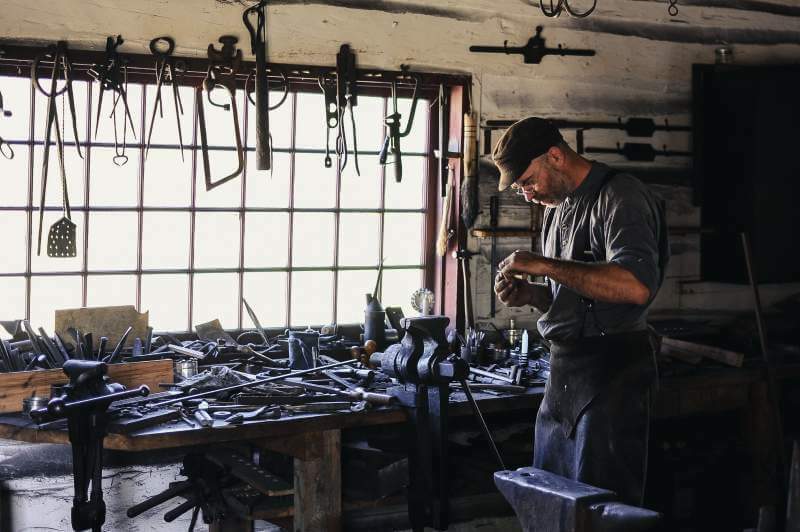 Having an organized and clean looking set up is proven to attract customers. A canopy can offer shelter and a great shop feature for your second hand treasure. Catering events. They also make an excellent, stable and luring food stall. You can go from a cool local ale or beer bar, to a full spit roast depending on how big the frame is. Ideal for any outdoor events like weddings, festivals etc. Garden parties. They make a great shelter in the garden to protect the kids during play-days and also to cover friends and family during dinner and evening drinks. Beach Trips. They make ideal pop up sun shades, which pitch fast and offer great protection from the sun. 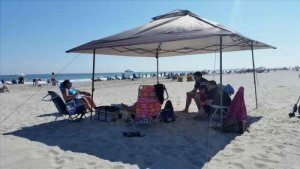 Often made with UV protected fabrics on their canopy covers, sun shade canopies are very popular for trips to the beach. Carports. Now modernly becoming popular as a car canopy. 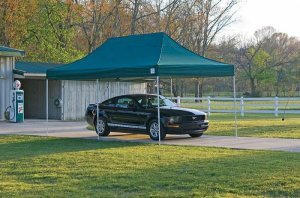 They have substantially larger designs and stronger materials so you can use the larger pop up canopy models as to cover your car at any event or at the home. Or put that new luxury motor on show during an event. How to set up a Pop up Canopy tent? This is a general guide for all pop up canopies except the largest one canopy available the 10×20 model, they require a slightly different approach because of the size. 1- Open the carry bag and remove the canopy from the bag. This may require 1 or 2 people to do. 2- Decide where you want to pitch it and position it directly in the center of this area. 3- Take hold of the frame on either side and pull, extending the frame outwards until its fully extended. 4- You then raise each corner upwards. Best way to do this is to place one hand on the frame pole and push the other hand upwards. Once it’s reached the correct level you will hear a click, its now fixed into place. 5- After you’ve heard the deafening click of doom, you can now pull the canopy cover over the top of the corners. Almost like a bed sheet covering all corners of the bed. 6- Adjust leg height. If you’ve ever used machine gym equipment, its exactly the same process. You push the pin inside and slide up or down, the pin will pop out again when it reaches the next hole. 7- Go around and secure each leg the same height as the other, to avoid any slant. 8- Secure. You can do this by hammering the skies through the feet holes and securing with ropes. Or simply using canopy weights, which is what will you need if you are in a public area or on concrete for example. 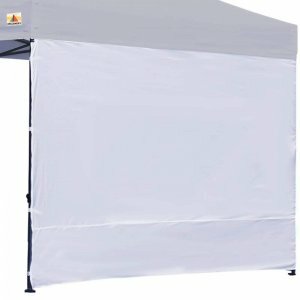 How to attach a Cover to a Pop up Canopy Tent? 1- Prior to set up, extend the canopy around 70% of its full extension. 2- Remove it from the packaging. This is much easier with 2 people. 3- Unfold the canopy cover and locate the 4 corners of the canopy. 4- Secure the pop up canopy cover the one side of the canopy first. They usually have Velcro on the outside of the frame, this is where you will attach and secure the cover. 5- Walk around and pull the cover over to the opposite side. 6- Secure on the Velcro attachment as before. Make sure the canopy cover hub is centered in the middle of the frame. 7- Secure the center hub to the frame, underneath the cover. 8- Extend the frame to 100% of its full extension and the canopy should now stretch out with the canopy’s frame. 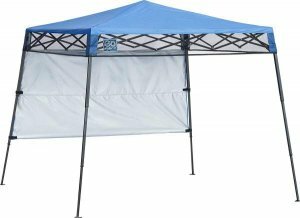 How to Fold or Pack Away a Pop up Canopy Tent? 1- Remove any canopy weights or spikes and ropes from the legs feet. 2- Secondly, Start by lowering 2 legs together on one side of the pop up canopy. 3- Walk around and lower the remaining 2 legs. 4- With all 4 legs lowered, duck underneath and detach the canopy covers hub from the frame in the middle. 5- Go back to the corners and release all 4 corner slides. Don’t force them down, just let them drop naturally. 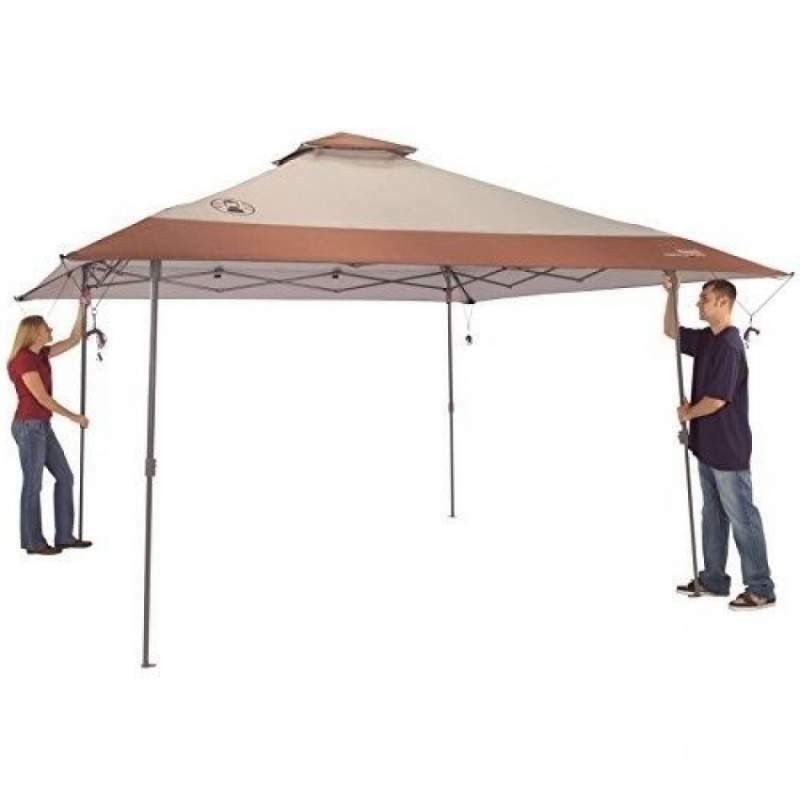 6- With all 4 corners detached, stand at opposite ends to your awesome set up buddy and gently push the canopy towards each other. The frame will collapse and corner sliders will drop further naturally. 7- Don’t push all the way, stop at about 75%, you can now easily remove the canopy cover. 8- Remove the canopy cover and fold accordingly. Usually standing at opposite ends to your partner and walking towards each other while folding works well. Then pack cover away. 9- Close the pop up canopy frame and place into the portable carry bag, tie the straps. How to Anchor a Pop up Canopy? If you are pitched outdoors, then you will likely have spikes and ropes to secure your pop up canopy. These are hammered through the spaces in the legs feet, The ropes are then pulled outwards and attached to walls, trees or anchored into the ground. These come in a variety of shapes and sizes, for different sized canopies. There are sandbags, which are filled with damp sand to help weigh down the frame. There are also PVC and plastic weights. These have many different fillings, like water, metal and sand. All work well as long as they can be secured to the canopies legs and have a fair amount of weight behind them. Straight Leg vs Slant Leg Canopy: What is the difference? You may have noticed these 2 types of leg designs in the list. Let’s go over what this terminology actually means. This design is most common. The good thing about the straight leg is that if for example the canopy is measured at 10 x 10, then the shaded area will be exactly 10 x 10 as well, you won’t lose any square footage. However, with the slant leg this isn’t the case, usually it’s a reduced shade size. 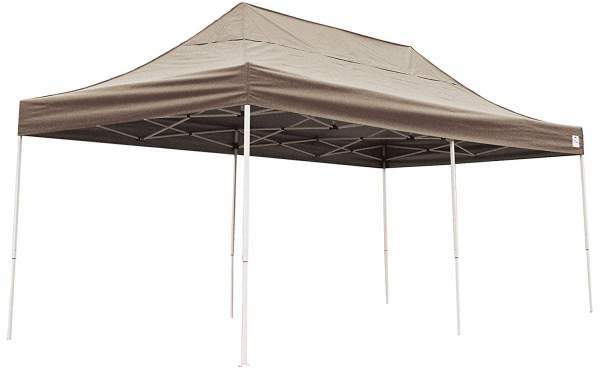 For example a 10×10 pop up canopy with slanted legs, you’re looking at an 8×8 roof size, offering 64sq ft. of shade. As opposed to a straight leg version, would give the full 100sq ft. of shade. Additionally, as straight legs are more popular for market stands, trade shows etc. it’s much easier to get a custom logo printed onto your canopy cover. This isn’t as simple for a slant legged cover. Slanted leg canopies help to keep the shade shadow in position when the sun is low, due to the angle. Generally more economical than their straight legged counterparts. This is because they focus more on a portable and ‘quick and easy’ aspect and suit less formal situations. 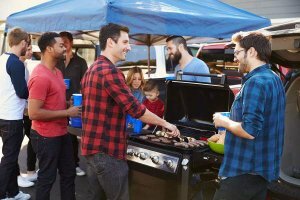 They are great for short-term tailgating, quick events like outdoor sporting activities and beach trips. Some manufacturers have developed a canopy that lies somewhere between the 2. For some of the larger options this is ideal, as the loss of shade is larger as the dimensions increase. The added stability of a slight angle is also beneficial with a heavier canopy. 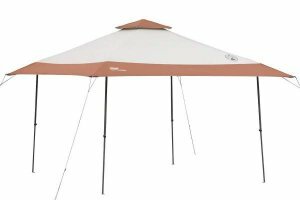 Can I Grill or BBQ under a Pop up Canopy? Yes you can. You just need to make sure that the fabric has some form of fire retardant material. This is crucial as some of the cheaper models have zero flame tolerance and are very susceptible flames and embers. CPAI-84 is the standard often used among Polyethylene tents and canopies, so look out for this in the product details. 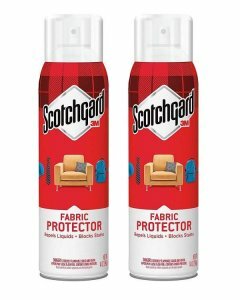 Some protective sprays are also available in shops and online, which can assist when using for a grill event. If you are cautious and the center height is far away enough, the sidewalls are detached, you will be fine. How to Reinforce a Pop up Canopy? There are a few ways to do this. Remember they aren’t really designed to handle the strong winds, also if you have things like side walls up in a gale force wind, that basically becomes a ship sail. Applying a proofing spray to the canopy fabric before any use is a very good idea, this keeps it fully water resistant from the get-go. A great example of proofing spray here. Click for more info. 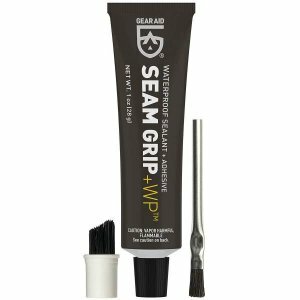 To complement the proofing spray, you can also use a seam sealant to seal up any zip seams and sidewall seams. These are usually the vulnerable areas where water seeps in, so get it protected before you begin to use. Apply to seams and seals surrounding the Canopy. Click here for more info. For the frame you can use a silicone based spray, which acts as a sealant. 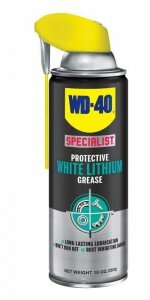 This works well and is recommended to apply a coating as it helps to prevent chips, peeling and corrosion. An excellent frame strengthener. Click for more info. For any unfortunate accidents resulting in any tears or rips in the fabric you can patch them up with a fabric repair kit or the heavy duty repair tape. 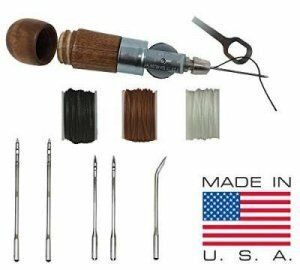 Great for a fast repair on a fabric tear. Click here for more info. All of these methods will really help to reinforce your pop up canopy and make it more durable, which in turn gives you much better value for your money. For more extensive repairs on heavy duty fabric. Click here for more info. How to Clean a Pop up Canopy Tent? You can wash the fabrics and covers with warm water and some canopy cleaning agent. After it has been cleaned and scrubbed thoroughly, just pitch it over the frame or hang it out to dry. It’s imperative that you let it dry out completely before storing it away. This stops the buildup of any mound or mildew while it’s in the carry bag. We don’t advise you to use any bleaching agent to clean the covers, this can affect the material and cause some color change in the fabric or erosion. How to Clean the Pop up Canopy Frame? For cleaning the canopy frame make sure the whole canopy is fully set up and legs extended to the highest level adjustment. Then you can begin to clean the frame with a tough cloth or scrubber. But, nothing too abrasive so you don’t scratch off the powdered coating or other protective properties integrated into the frame. Hot water, non chemical soap and a strong arm will suffice. Do I need to Remove the Cover when I Pack it Away? When the cover is stored while wrapped around the metal framework, it can start to wear and may develop rips and tears in the fabric. So for longevity and durability, just take it off every time you store it away, fold it neatly and store separately. Pop up canopy tents are a great modern take on the traditional models and are definitely a million times easier to set up. However, please bear in mind these are designed for fast and easy use. Portable and lightweight, but not meant for consistent outdoor use for years on end. With the cheaper price tag than the robust $1000 models, you need to do your part to ensure its durability. Take down after use, read our reinforcing guide in the FAQ, and take action to keep it in good condition. Overall they are a great option for many outdoor events, making these events much easier to manage when you don’t have to worry about hours of setting up. 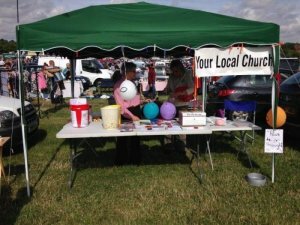 If you didn’t find anything worthy here, check out our Pop Up Gazebo article or perhaps a Car Canopy if you need something of a much larger size. Don’t see your question mentioned? Please comment below or send us a message on the contact us page. From the Tent Hub Team, we hope you enjoyed it, until next time!